The look of stone or brick, as you can imagine, can be quite costly due to the labor and the materials involved. Thankfully, stone veneer, a popular alternative which mimics brick, can be installed for a fraction of the cost and will look just as good from a distance. Stone veneer, aside from its low cost, also has other positive features such as lower energy costs due to the insulation which can be used during the install process. The costs to have stone veneer siding installed will all depend on the size of your home, the condition of the exterior, the materials/brand you choose, where you live and the contractor you hire. From our research, the costs other homeowners paid were anywhere from $10 to $20+ per square foot installed, making the average 1,600 square foot home costing anywhere from $16,000 to $27,000. As all jobs are so different, we highly recommend gathering quotes from locally licensed contractors from HomeAdvisor.com. Here, you can explain your job and contractors will offer you a free, no-obligation quote, either by email, phone and/or in person. This is a great way to save time, especially if you do not know how to research your local contractors and/or don’t have the time to do so. The Quarry Mill noted the costs to install natural stone veneer will depend on the site prep, location, installation style and the contractor you hire. In the end, standard installation could range from $14 to $28 per square foot without the stone or up to $45+ per square foot on the higher end. 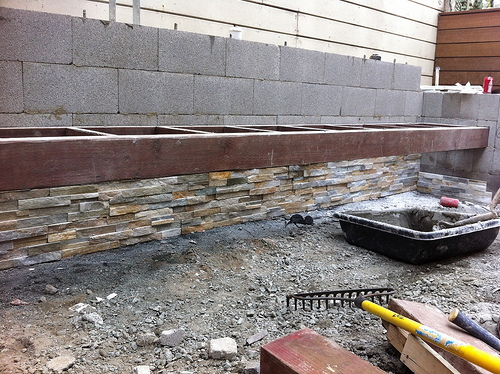 As stone veneer material can often be heavier than related material, additional support may be required to the exterior walls. If this were the case, something known as a metal lath, which is a material made of metal to offer additional support, would cost an additional $1 to $2 per square foot. If the veneer is being installed on an existing home, then you will need to factor in the additional destruction costs to remove the existing exterior siding/brick. depending on the time it takes to prep and destroy the areas in question, this could add an additional $1 to $3 per square foot. Homes with multiple stories and/or awkward details can increase the costs by more than 20% due to the time it will take contractors to complete the job and scaffolding needs. Taxes and permits will not be included in the estimates mentioned prior and will greatly depend on your geographical location. Most permits will cost less than $500 total. In some cases, a contractor may find additional issues, especially when installing siding on an existing home. This could include electrical problems, an infestation and/or structural issues. Upgrading the insulation sheet, which is installed behind the stone veneer siding, can increase the costs by as much as $1 per square foot. Stone has been used for centuries, dating as far back to the pyramids in Egypt which are still standing to this day. While stone veneer siding may not last as long as the pyramids in Eygpt, it should last your home’s lifetime. Stone veneer siding, from a distance, looks no different than natural stone, and aside from the beauty of stone, few siding options can compare to the durability and performance stone veneer can offer. It’s considered to be an excellent protector to fire, water and is an amazing insulator to keep your home cool in the summer and warm in the winter months. No two homes will look the same if you do decide to purchase a stone veneer siding as many manufacturers offer hundreds of choices in terms of color and texture. As mentioned countless times already, stone veneer siding will look just like stone and will be a fraction of the cost when compared to the real deal. Stone veneer is real stone, but the thing that differentiates it from real stone is the thickness as a stone veneer will use slices of the stone, rather than whole rocks. Since you’re paying less for the materials, the labor, in turn, will be reduced, effectively lessening the costs. As with anything, there are disadvantages. For one, there are some varieties which will not look like the real thing, disappointing some homeowners. Secondly, if you live in an area prone to a lot of moisture, this water can make its way behind the stone, often creating gaps in the mortar.